I must confess, I spent most of Halloween morning and afternoon crying. I was writing about Joey for a submission that was due that day, plus it was a holiday - a kids' holiday to boot. It kind of comes with the grieving territory. Sigh. I've been very sad for a very long time, and I'm not sure how many people who are "close" to me realize that. I think maybe they think I'm ignoring them or something, when really I think I'm trying to figure out how to go through a second wave of grief. So many things are changing and time keeps marching on, all without our precious Joey. For some reason, the boys have been talking about Joey a lot lately. Slim was watching a video on one of his favorite sites, BrainPop.com when he read about a certain type of scorpion venom being a cure for cancer. "Maybe we should have tried that for Joey." Trust me, if I would have known about that, I would have been willing to try. The night after Halloween, Knox was all weepy and saying that he missed Joey. He asked Hubby if he was sad that Joey was gone. I think he just wanted to talk about him. In addition to the catharsis that blogging and writing give me, I have found support in an online community that is always available. At a time when I feel like so many of my real life acquaintances have moved on and forgotten that we are still grieving (those of you who haven't know who you are, and I thank you for that), there is a whole community inside my computer of people who just "get it." And they are there any time I need them, too. So when two of my blogger friends, Jen and Jessica, decided they were doing NaNoWriMo (National Novel Writing Month), I decided to plunge in with them. Jen is the brilliant mind behind the popular blog People I Want to Punch in the Throat, as well as the author of the fun and funny Christmas book Spending the Holidays with People I Want to Punch in the Throat and the creative genius behind the popular compilation I Just Want to Pee Alone. She is smart, savvy, super supportive, and so much nicer than her throat punching might suggest. Jessica is the huge heart behind the inspirational blog Four Plus an Angel and fellow Sunshine After the Storm contributor who lost one of her triplets shortly after birth. Her beautiful heart is the driving force behind the second annual Holiday Clothing Drive. She gets me and my sadness and always has amazing words of encouragement and support. The idea behind NaNoWriMo is that you write every day during the month of November - 50,000 words total - so that ideally you have a whole novel by the end of the month. There are groups and pep talks and word counts and no reason not to do it. How long have I been saying I am going to write Joey's story?? Three and a half years now, that's how long. It's been a long time. I have forgotten details. Hubby says this is not important, but I disagree. People always want to know the details. What if I can't write every day? I already missed yesterday. It's okay, the words are there. If I don't make 50k by the end of the month, it is okay. It will be a start. What if it makes me more sad? What could make me more sad than Joey not being here? At least I will remember some of the things that I have forgotten. Even in looking through my Caring Bridge entries and pictures and notes that people wrote to us, I have remembered a lot. What if no one wants to read it? So be it. It will be for us. And that one person who needs it. I keep thinking of all the messages I have gotten from people, especially from when my post "Pictures Can Lie" went a little viral, who thanked me for putting into words what they could not. For helping them face their pain. I keep getting this panicky feeling that it's now or never. Enough said there. Yesterday, something happened that made me think I need to change. You can read about it here on my Facebook page. Lil' C is a six-year-old boy who has been learning about things and decided to do something. Period, end of the story, no one was talking him out of it. Wow, just wow. 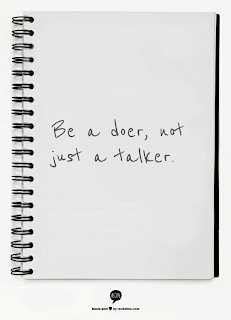 I need to be a doer and not simply a talker. I quite often say I'm going to do things. A lot of things. Oh, my intentions are good, but you know how the saying goes: The road to hell is paved with good intentions. Now, I know I'm not going to hell if I don't write this book, but it will be hell for me in my mind knowing I could have and should have. So friends, I'm doing it. And if it means not updating my blog or trying to think of something witty to put on Facebook (What? I can be witty sometimes. ), then that is the reason for my silence. I'm telling you because I want your support. I want you to ask me about it. I need for this to get done, ideally in time for next September's Pediatric Cancer Awareness Month. There it is. I'm writing a book.